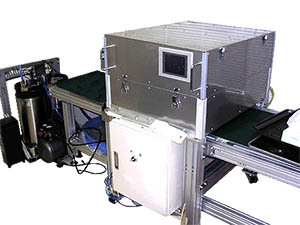 This machine will coat a certain quantity of vegetable oil in a certain pattern on the baking tray, so that the products such as the breads, cakes will be detached from such baking tray. Enhancement on the product quality and improvement on the operation environment. -If the oil quantity to detach the products from the baking tray should be too much, taste and eating sense on the product will be changed. -If the oil quantity being stuck onto the baking tray should be too much and therefore baking tray might be burned, the nature of the baked products will be changed. -Diffusion and spill of the oil make the operation environment deteriorated. - Oil quantity is even . - Using an oil coating pattern created by personal computer, such various pattern can be coated on the baking tray. - Oil quantity is adjustable. - Diffusion of an oil is NIL. It can coat on the limited area where the products shall be put and baked on the baking tray, which will result in the prevention of operation environment from getting deteriorated. -It will save the various cost such as oil cost itself, cleaning cost on the baking tray. Oil consumption Saving to minimum depending on pattern creation Because of spraying oil on all the surface of around products, oil consumption is biggest. Due to spray on parts other than products,Oil consumption is bigger. Oil consumption is small , but uneven. environment No oil diffusion Saving oil clean environment bad bad No oil diffusion but around machine will be dirty. 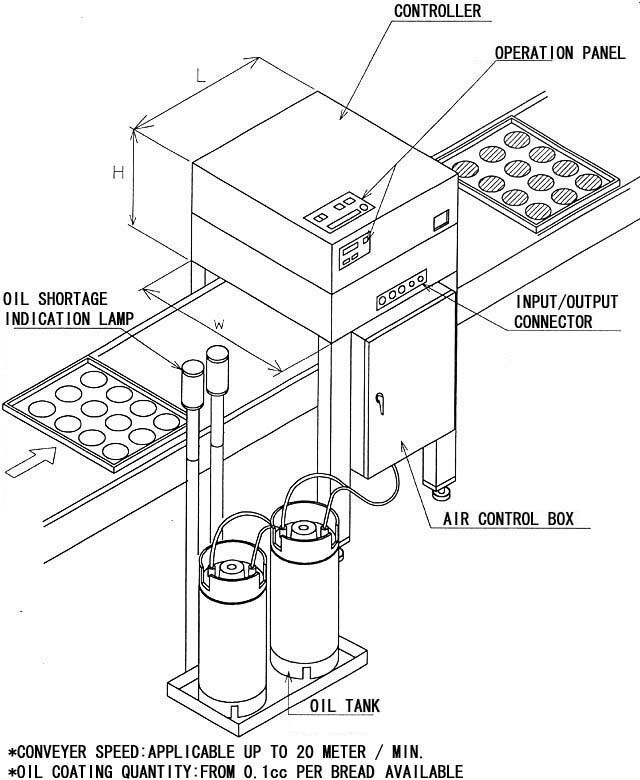 Others - This product will spray oil by static electricity.Whole the machine will be stuck by oil. Cost of cleaning is expensive. Multiple nozzles can not be applied.Over spray occurs,result in bad environment. According to change in the type of baking tray, this shall be also changed.